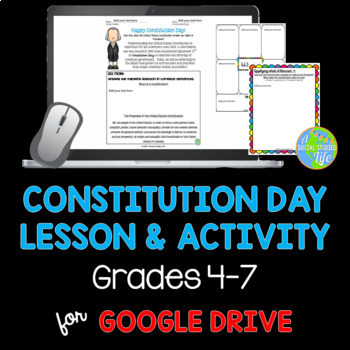 Constitution Day is September 17th! Many states in the U.S. require that teachers (especially Social Studies teachers) stop whatever they are doing on September 17th to discuss the Constitution! 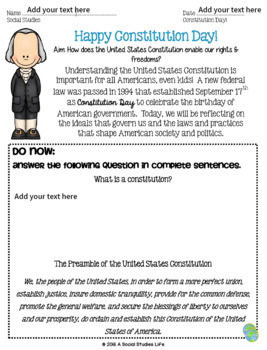 This introductory lesson and graphic organizer outlines the basics of the Constitution for your students. • Do Now question: What is a constitution? What is a preamble? ★★ LOOK HERE!!!! --> You will notice that this product does not come with a reading passage. That is because I have left open the opportunity to use your own! I use the website entitled The Constitution for Kids. I break the students up into cooperative groups and have them complete a jigsaw activity using the reading. This way, each group is responsible for their own segment of the reading passage and must be able to "teach" the other students. If you would more information on how to execute a jigsaw activity in your class, email me at asocialstudieslife@gmail.com. Digital, 1:1, interactive Social Studies learning!